Also: A pup who's terrified of washing machines, and a very noisy rabbit. Why is my cat obsessed with hair? Every time he sees my hair, his eyes get big and he starts purring and wants to bury his face in it. He does the same with friends who visit. Be happy that your cat is obsessed with hair, and not something more … awkward. There are a few widely accepted reasons among animal behaviorists why your cat licks and sniffs around your follicles and the most likely one is super sweet: He is attempting to groom you. Not because you need a shower or anything, but as a sign of affection and protection, just like the way a mother cat instinctively licks her babies. Coaxing hair to look perfect can take a fair amount of time and effort, so it’s totally understandable that you might not be 100 percent thrilled with your cat smushing his face into your ’do on a daily basis. Is there a chance that you and your friends use a particularly fragrant shampoo? He may like the smell or taste of your hair products! Try switching up your shampoo, and see if this alters your cat’s hair addiction. If that doesn’t work, you could always wear your hair up in a bun or ponytail (at least for the time being) to keep the temptation in check. I have an (almost) 8-year-old female Dalmatian. I just recently moved to a house with a backyard and her pee is absolutely burning the lawn like crazy! My boyfriend and I try and pour water on it once she’s done, trying to dilute the acidity, but nothing’s really helping. I will also admit that I can be a little lazy at night, and I don’t really want to go out and pour water where she peed. I’ve heard that there are some options, such as giving your dog a tablespoon of tomato juice every day or adding brewer's yeast to their food. I had a Dalmatian when I was little and I remembered someone telling my parents that there is a grass saving product you can get from a PetSmart type of place, but that Dalmatians are very allergic to it. I can definitely understand your desire for a well-maintained patch of green, but if your dog is on a diet that’s working for her, don’t change it! As my vet friend Dr. Robert Proietto explained to me, the discoloration in your grass is caused by the level of nitrogen in your dog’s pee. The more protein in pets’ diets, the more nitrogen they release when they, well ... release. Female dogs can cause more damage because they tend to do their business all in one spot, whereas male dogs will “spread the love,” marking a little here and a little there. Restricting the amount of protein your dog eats isn’t a good idea, and a lot of those “home remedies” for “neutralizing” a dog’s urine will not work the miracles they claim. The second and more time-consuming option is to train your dog to pee in a set area of the yard where you can mitigate the damage. Plant a patch of a hardy type of grass like fescue or perennial ryegrasses for her. Teaching an adult dog to do her business in one specific spot will be time-consuming, but in the long run, it’ll save you those annoying midnight jaunts across the yard. And, remember, you can hide almost anything with a well-placed garden gnome. Hello Dodos, I have a question about my two little rabbits. They are siblings and both are around 5 months old (one girl, one boy). They have good care as they have food, hay, water, a lot of space for running, etc. What makes me worry is the girl. At night she makes weird noises like "honking." What I have read is that they make the sound when they are happy, but I am not sure about this. She makes it only at night, when I try to catch her she makes it louder and when I caress her, she is making it less and for some time she stops. Can you please help me and advise on what it could be? Let me answer your question with a question: Are your rabbits fixed? Unless you’re planning on turning two rabbits into hundreds (please, don’t), call up your local vet and get on that stat! Unspayed female rabbits have a very high risk of reproductive cancer, so getting her spayed now can protect against serious health risks, extending her life significantly. It may not sound like Mariah Carey, but those funny honking noises coming from your bunny are most likely her version of a little love song. Rabbits make these noises when they are looking to woo a mate, and the fact that your bunnies are siblings won’t stop them from getting frisky (think a furrier version of “Game of Thrones”). If your rabbits are spayed and neutered, your female bunny may simply be making these joyous sounds when she’s pleased or excited; say, when she’s eating a particularly tasty treat, or playing with her brother. Rabbits are most active at dawn and dusk, which could explain the inopportune timing of these happy songs. Invest in some earplugs and rest easy knowing your rabbits are having fun. We moved into a similar townhouse and my dog shakes and pants and freaks every time I run the washer. I can't do laundry unless I hold her — and I mean the whole time — and pet her to calm her down. It’s the only time she does it and the washing machine is not loud. Our pets have seemingly irrational fears and anxieties just like we do (clowns, anyone?). Obviously, you don’t want to upset your pup every time you do a load of laundry, but living in filth isn’t workable either — unless you’re in college. So how do you get your dog and your washer/dryer to live in peace and harmony? While we can’t force our dogs to be BFFs with household appliances, you can help them build positive associations with the spin cycle. Praise your pup and speak to her in a happy tone of voice every time you start a load. You can help ease her stress with a snug DIY wrap. If she is hesitant to go near the contraption, try feeding her in an adjoining room and, over time, move her food bowl closer and closer to the action. Special treats, like a piece of cheese, or a favorite toy that she only gets during laundry day, can work wonders, too. Have an animal question? We're here to help! 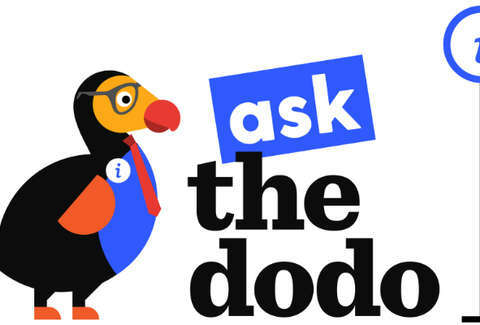 Send your questions to ask@thedodo.com and you could be featured in our next post.